We are all back at work after the long year-end holiday and probably have gained some pounds with all the eating. How do we get back on track? The good news is that you can knock off the excess weight that you have gained in the last few days, with some effort from your side. So, don't fret over the extra pounds. 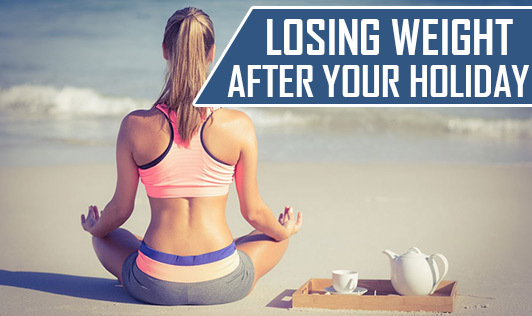 Forget detox diets and crash diets to lose weight. Concentrate on eating healthy and exercising regularly. Write down your goal for weight loss. Be realistic. It's not possible to drop several pounds in a few days time (although it's easy to gain them!). Remove all treats and tempting foods from your kitchen and refrigerator. Stock plenty of vegetables, fresh fruits, dry fruits and other healthy foods. Purchase foods that are low in fat and sugar. Divert your attention when you see high-calorie foods that tempt you. Walk, walk, and walk - in your home, in the office, to the bus stop, to the grocery store, to your colleague's desk, up and down the stairs and everywhere possible. Form a small support group with like minded people who are looking to lose the 'holiday weight'. This way all of you can motivate each other and weight loss will seem like a child's play!